Messier 62 (M62, NGC 6266) is one of the most irregularly shaped globular clusters, as was first reported by Herschel. This deformation may be a result of the fact that M62 is one of the closest of Messier's globulars to the Galactic center (only about 6100 light years), so that it is deformed by tidal forces. Its central condensation is obviously displaced from the center, to the lower right in our image (SE). From its apparent size and magnitude, M62 is very similar to its neighbor, M19. Physically, they are a bit less similar because their distances are somewhat different different: M62 is at 22,500, M19 at 28,400 light years, according to W.E. Harris' database. M62 appears at a diameter of 15 arc minutes, about half of the Full Moon, corresponding to a linear extennsion of about 100 light-years. 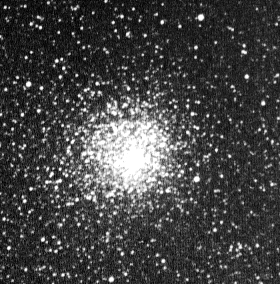 There are more intrinsic differences between these two globular clusters: M62 has the large number of 89 known variables (number of 1973 ! ), most of them of RR Lyrae type, while M19 has only 4. Moreover, contrary to M19, the core of M62 is extremely dense and has possibly undergone a core collapse somewhen in its history, similar to a number of other globulars including M15, M30, and M70. However, M62 also differs e.g. from M30, another post-core collapse globular, by the fact that it contains a large number of X-ray binaries, according to observations with the Chandra X-ray Observatory satellite. These particular stellar systems are thought to have formed in close encounters of member stars of the globular cluster; apparently, such encounters have occurred frequently in M62. Charles Messier found this cluster on June 7, 1771, but took an acurate position only on June 4, 1779, so that his catalog entry had this date. Otherwise, it would have come between the numbers 49 and 50. 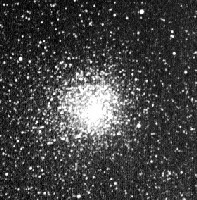 Like most of Messier's globular clusters, it was first resolved into stars by William Herschel, who called it a "miniature of M3."